Jim’s purpose in teaching yoga is to help make yoga available to all. He seeks to point the way through yoga to finding joy and peace both on and off the mat. Jim’s mantra is that yoga is good for the body, fine for the mind, and great for the soul. 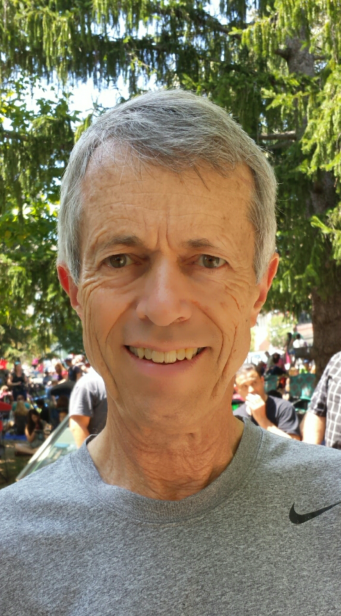 Prior to completing 250-hour Teacher Training at Asheville Community Yoga and becoming RYT-200 Certified by Yoga Alliance, Jim taught college-level geology and environmental courses for 22 years. In recent years, his college classes incorporated yoga during a break midway through each lecture. Jim felt greatly honored when, during a departmental awards ceremony, students presented him with the “Lotus Award for mastering grace and balance through yoga in the classroom.” It was the enthusiasm of these college students for yoga and Jim’s own passion for yoga that inspired him to teach yoga classes. He is deeply grateful to his enthusiastic students, to his yoga teachers, and to Asheville Community Yoga. You are invited to join us for a practice of movement and breath that respects our bodies and comforts our minds. Enjoy the benefits of yoga in a fun and relaxing way. The class is taught with acceptance and without judgment, seeking to bring peace and compassion to each of us that will continue beyond our time together. The class is designed for students who are 50 and up, and remains open to all ages and levels. Beginners are welcome. Props and modifications are provided. All levels and ages are welcome in this class, which uses chairs to help ensure an accessible and safe yoga practice. Options and modifications are offered to encourage students to discover the forms and movements that they find most useful. This approach can build awareness and improve strength, flexibility, and balance in ways appropriate to each individual student. Creative exploration of yoga postures and movements is encouraged. A theme or intention is integrated within each class to serve as a guide toward experiencing peace and happiness. The uniqueness of each student is honored and appreciated as we share the yoga practice, helping bring us together as community.